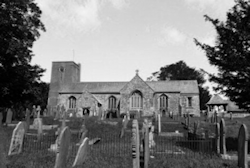 It seems surprising that the countryside at the head of the valley of the Yealm River supported, in those days, a population who could have afforded to build such a large church. On the other hand the Parish is a large one, extending from the line of the A38 between Ivybridge and Lee Mill in the south to the moor on the skyline in the north. In particular it contained, even then, four great houses and their estates. Three of these were manors mentioned in the Domesday Book in 1086 - Cornwood (the present Delamore estate), Blachford and Fardel. The fourth house, Slade, was in existence in the reign of Edward I and was important enough to be shown on its own on the first map of the County of Devon in the late 16th century. The oldest part of the Church is the squat, slightly tapering tower. The remains of its lancet windows suggest that it dates from the early part of the 13th century. 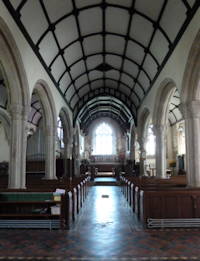 It was probably part of an earlier building whose nave and chancel may have corresponded in size with the present nave. 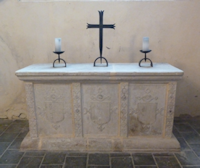 We know that the Church and three altars were rededicated in 1336. Standing with your back to the font you can appreciate the proportions of the Church: the slender granite pillars, the absence of the rood screen, the finely carved early Jacobean pulpit and the waggon roof of the nave and aisles with its carved oak bosses. The chancel roof, which is panelled in oak, is Victorian as are the six gilded musical angels. All the stained glass in the windows of the Church was installed in the late 1800's, the original glass having been removed or smashed during the Commonwealth at the same time as the rood screen at the entrance to the chancel was pulled down. As you go down the north side of the Church you pass a memorial to Captain Benjamin Burell, a captain in Charles I's army, and the more recent memorials to members of the Treby, Hays and Parker families of Delamore. Altogether three houses have been built at various times in the area of Delamore by the Lords of the Manor of Cornwood. The Lordship was successively held in earlier days by the families of Courtney, Cole, Bellmaine, Treby and Praed. The Parkers have held it since 1857. The most obvious feature of the chancel is the reredos of Derbyshire alabaster and Italian marble, and the arcading round the end of the chancel and the altar rails themselves are in the same materials. This was put in by Lord Blachford in 1867 and replaced the original oak paneling. Shortly after restoration in 1875 the choir stalls were fixed and the old square pews replaced by the present pine ones. The altar replaced an original carved wooden altar. On it stand two large candlesticks and two three-branched ones, all of brass gilt. The cross is of a similar period to the candlesticks. The sanctuary lamps are Italian, probably they were originally censers, and one is dated 1538. The chancel does contain signs of the original layout in the shape of the triple sedelia and piscine of the early 14th century on the right. On the left, by the vestry door, is another of the piscinas of the three altars dedicated in 1336. On the south wall of the chancel there is a monument consisting of two white alabaster figures in Elizabethan costume, the gentleman kneeling on a cushion at the prayer desk facing a lady kneeling opposite. The inscription describes them as Robert and Dorothy Bellmaine of Dalamore who both died in 1627. It is worth walking first to the right to look at the tower which is now rendered on the outside. It is short in proportion to the rest of the building and lacks the pinnacles at the corners which characterise other Perpendicular churches such as those at neighbouring Harford and Shaugh Prior. Return to the lych-gate, given by Lord Blachford. In the graveyard running to the south are the older graves near to the Church and in the middle the railed enclosures of the Parker and Marin families. The land for the enlarged graveyard was given by the Parkers. In the outer wall of the south aisle is a 17th century memorial which includes a skull and crossbones, typical of that period. By the lych-gate is a fine 17th century chest tomb in granite. It commemorates John Mason of Langum (Langham) who died in 1639. A similar tomb, about 25 yards to the south west, is in memory of Rich, the daughter of Mr. William Cholwich, who died in 1655. The path to the left from the lych-gate leads round the back of the church where there are some of the oldest graves, particularly the enclosed burial place of the Rogers family and the raised tomb of Admiral Trefusis. Forming the boundary of the churchyard to the north is the Church House, which was a Dame school before the building of the present school in the village in 1859. In 1783 the cost of repairing Cornwood Church was 15s. 4d. according to a Return. 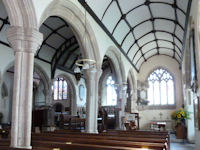 It now cost several thousands of pounds a year even to maintain the Church for the use of parishioners and visitors. The restored and enlarged Church was re-dedicated by Bishop Grandisson on 19th June. Henry Smith, who had been instituted shortly before the rebellion against Charles I "was treated in a most Barbarous and Inhuman manner… his House was also Plundered by a Party of Soldiers form the Garrison of Plymouth, who did not so much as leave him a Dish or a Spoon. At the same time they Plundered him of his books also… himself, his Wife and five or six Children were all turned out of Doors and subsited for some time by the Charity of the Neighbouring Gentry (his estate was sequestrated)… He was… sent to a Common Jayl in Exeter, where he died soon after the Martyrdon of his Prince…" Walter Shute was later intruded on the vicarage. He is said to have preached a blasphemous sermon, in which he derided Kings and Princes, on the anniversary of the martyrdom of Charles I. However he conformed at the Restoration and was allowed to continue in the living, being properly instituted on 8th November 1662. He it was who allowed the Church to be abused, the rood loft to be pulled down and the painted and stained windows to be broken. Much of the detailed information above is based on "Cornwood Notes" published privately in 1918.